And the interconnectedness of major banks means the banking systems and economies around the world are all affected. What we are trying to do is to say where there are opportunities to increase capital and liquidity, take them." 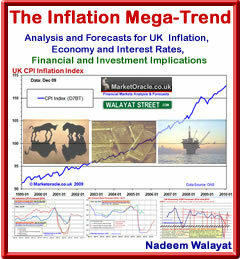 Summarising a series of recent articles (walayatstreet.com), ignore what the ECB and German politicians are publically stating, they WILL print money, they WILL bailout the european banks because the Inflation reasons for not printing money are fundamentally flawed, perhaps it has not dawned on those in charge yet because they are listening to clueless academics. The reason is this, if they fear inflation from QE money printing then what the hell do they think will happen to the Euro-zone inflation rates if the Euro collapses ? It is all brinkmanship, the Germans want the southern states to cut their budget deficits so they are delaying the inevitable money printing bailout to ensure countries such as Italy suffer enough pain to adopt fiscal responsibility, however the risk is they ms-calculate and the markets blow the euro up, that is the bottom line risk that the Germans have miscalculated and start to print money via the ECB too late. I have pulled my funds out of all euro-zone banks. I am in the process of exchanging most of my cash for hard assets such as property and already am stocked up to the eyeballs with inflation mega-trend leveraged assets such as commodities, and dividend increasing stocks. Why do you dislike tracker mortgages so much? Surely whatever happens to market interest rates in the UK, the BofE will not increase base rates for some time yet, or am I misunderstanding something? We will default (I would have thought) by forced currency devaluation rather than forced deflation through much higher base rates leading to massive repossessions. If the central banks first remit is to protect their brethen, why would they wish to inflict further pain by forced repossessions due to higher base rates? .....or are lower base rates and tracker rates the CALM BEFORE THR STORM? Please would you explain how Bank of England base rates are determined. Currently, we are witnessing mortgage rates (in general) rising depsite base rates remaining at historic lows. What could force the Bank of England to raise base rates? Surely, if the conditions remain tough for the economy, base rates will remain low for a very long time, or am I being naive in suggesting this. Also, why is it that the markets are allowing negative real gilt interest rates to exist in Britain. In the 1970's this did not happen. Market interest rates on 20 year notes went to 15%. Couldn't the Bank of England just keep buying the gilts to avoid yields going up, or am I missing something here? Would appreciate your thoughts, as I just feel this Government has been tempting fate with telling the world how low our rates are. Nadeem is the best I have found at analyzing the near-term moves in the markets. I am adding my "big picture" analysis. As you can tell by writing two long comments (after promising to stop commenting), I am worried that Nadeem is misunderstanding gold at this juncture. Well at least, I want to read his analysis about it. Thank you Nadeem for all that you do. Historically gold will peak at a ratio near 1 to DJIA, thus we still have about 8 - 10x relative gain in gold before it peaks. Although it appears from the above linked chart, that gold is within 67% of its relative peak to a median house price, please look at the chart going back to the 1800s. I have a theory. See how the volatility in gold-to-house ratio was much less volatile and much less volatile than the gold-to-DJIA, back when house were not part of "financialization". See how the 1980 volatility in the gold-to-house ratio was much greater and got closer to the extreme in the gold-to-DJIA. Well remember the level of the USA 1980s S&L bailouts? That was a couple $100 billion of peanuts compared to the current global real estate financialization, with a $quadrillion of derivatives of financialization. Thus my theory is that the median price of a house will be devastated relative to gold going forward. Gold is not a commodity. The elite understand that ALL fiat systems end (every case in history of world), and they hold their gold for decades waiting for it. We are now at that juncture. The only solution to the demographic bankruptcy is remove the borders. P.S. besides my infamous silver price prediction in Oct. 2010 (see my articles), I also called the top of the silver price above $20 in 2008 and made the call to sell out of mining stocks in 2008 (this is the forum jasonhommelforum.com/forums). Your not factoring in market risks, and what happens to the yield curve either by design or accident. Your basically saying you want to finance long-term debt with short-term borrowings, in my opinion that is a recipe for disaster as the bankrupt banks found out. They are rising because market rates are rising because inflation is high. The bank of england is monetizing debt, this is sowing the seeds for very high inflaiton, which I will cover in my next artice. I think stocks will outperform gold, especially as market rates rise. Gold is a commodity until it stops being a commodity , which could occur in the lead up to an hyperinflation panic. Until then it's price trends inline with sentiment of market participants and will be volaile as any other commodity. Can you recommend the safest bank for cash if the banking system was really going to collapse i.e. within a few days. IF it looked likely that the government was unable to prevent a collapse of the banking system then the safest place for cash would be in bank notes preferablly in a safe rather than under your mattress. My Mother had a bond with Bradford and Bingley which has been taken over by Santander, we went in to try and take the money out and they siad she was unable to do this even though she was willing to give up the interest. They said this was to keep them liquid. Is there anything that can be done? Usually you can exit early in exchange for loss of some interest. Exactly which bond is it i.e. Title and term as well as when did she invest, and I'll do some research. The bond is a 1 year reserve bond, it is printed on Alliance and Leicesster pater and was taken out on the 31st August 2011. So your saying its a A&L bond not B&B. I have found a A&L reserve bond that states no withdrawls or early closure, so if its same or similar suggests that there is no get out early option. In my experience approx 1/2 of bonds do not allow early exit.